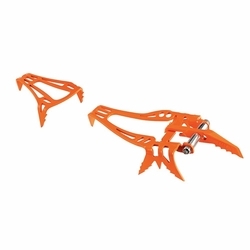 Petzl D-LYNX Crampons. Screwing the mono-point D-LYNX crampons directly onto shoes reduces weight considerably and improves rigidity. The shape and angle of the points are designed for expert use in dry tooling, mixed or ice climbing. The D-LYNX offers more striking precision thanks to the front/back positioning adjustment.